Add light and ambiance to your indoor or outdoor space with these classic vintage string lights. Featuring 7-1/2-inch galvanized shades sculpted into a lovely flower shape and strung along a discreet black 48-foot long 14-gauge cord, String Light Company's vintage string lighting adds old-world ambiance to any nighttime outdoor event from simple patio dinners to summer wedding receptions. 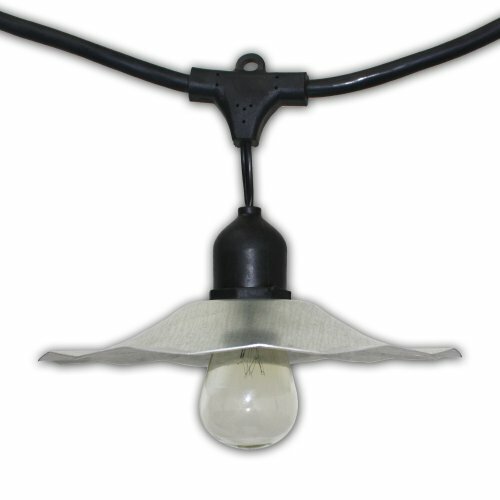 Weatherproof for indoor or outdoor installation, the 15 molded-rubber light sockets are 3 feet apart and offer integrated hanging loops for easy stringing. Male and female plug at each end; additional strands can be added. Use with medium size base bulbs (bulbs not included) from 11- to 25-watts. A-15, A-19, or S-14 bulbs recommended. String Light Company is part of TIAB INC. (Table in a Bag). Our mission is to provide high quality products to consumers around the world. We strive every day to achieve this goal with our work ethic, quality selection of materials, competitive prices, and friendly service. We owe much of our success to three important members of the TIAB Inc. Team: our associates, our partners, and our customers.